On Chor 4 I had my lunch with my big sister, my brother-in-law, and my love at the Three Little Pigs and the Big Bad Wolf, Tropicana City Mall. 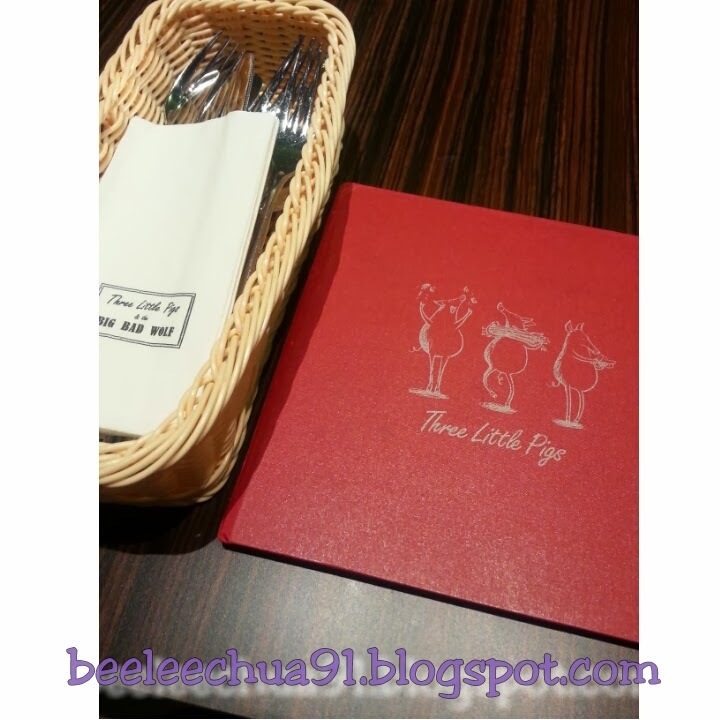 It is apparently my first time having my lunch and ordering from the Three Little Pig's menu. The sparkling water (from Italy) we ordered then came. 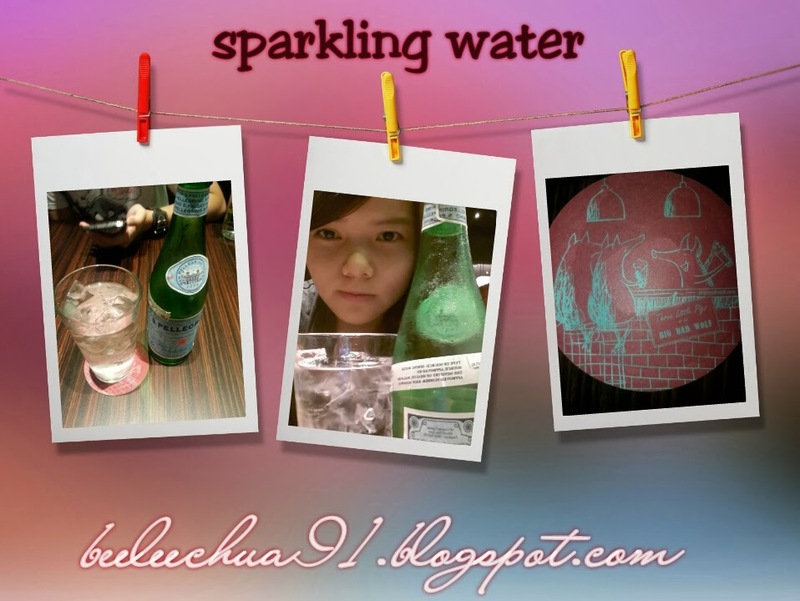 It was my first time drinking sparkling water. It's weird for me as I do not understand why people would want to consume water with gas in it. Oh well. *gulp gulp gulp* Gotta finish it off as it was so so so expensive. Just 500ml it cost us rm14. So not worth it as I do not understand the concept of sparkling water. The food took some time and it made us hungry. 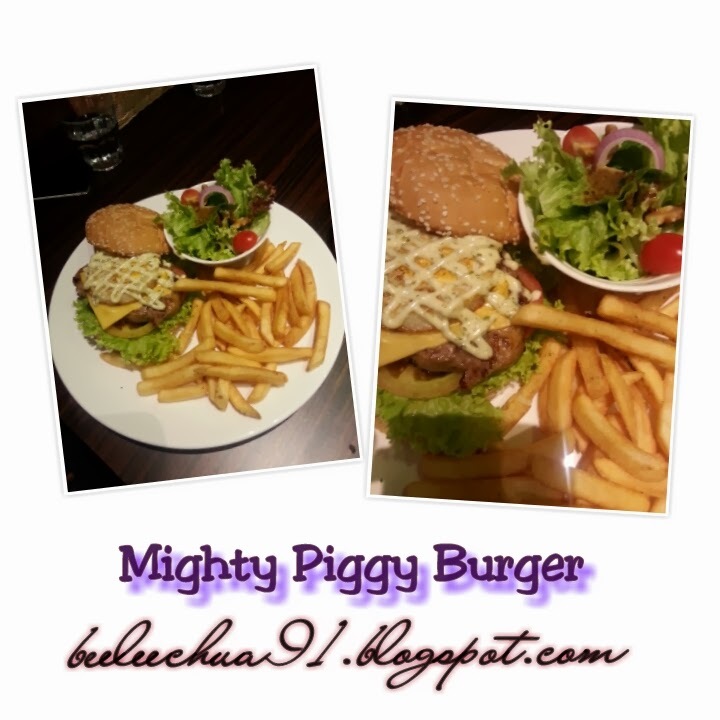 The first dish that was served was my sister's chosen Mighty Piggy Burger. The description as taken from the menu is: juicy pork patty, cheese, tomatoes, greens, fried egg, and mayo that contains herbs. Sister said it is not that tasty and not as good as expected as the pork scent was so strong and I also find it unpleasant upon trying a bite-sized amount from my sister's portion. The next dish that came was my brother-in-law's, The Wolf's Favorite. According to him, it was a rather tasty dish. I love how the poached egg looks, so cute and puffy like small portion of the clouds on the spaghetti dish. 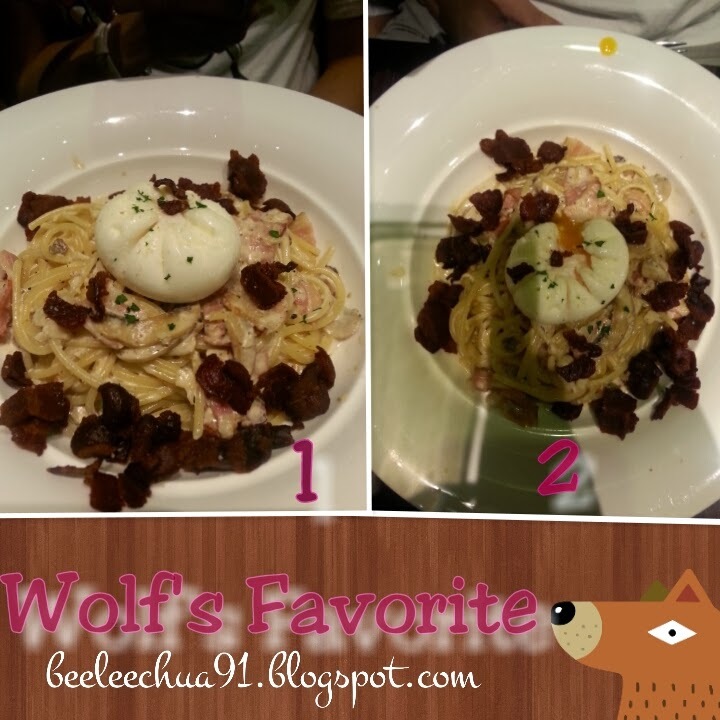 The Wolf's Favourite comprised of white creamy spaghetti with smoked pork bacon and button mushrooms, topped with poached egg and crispy bacon bits (as written in the menu). Next came my Cheesy Pork Lasagne. 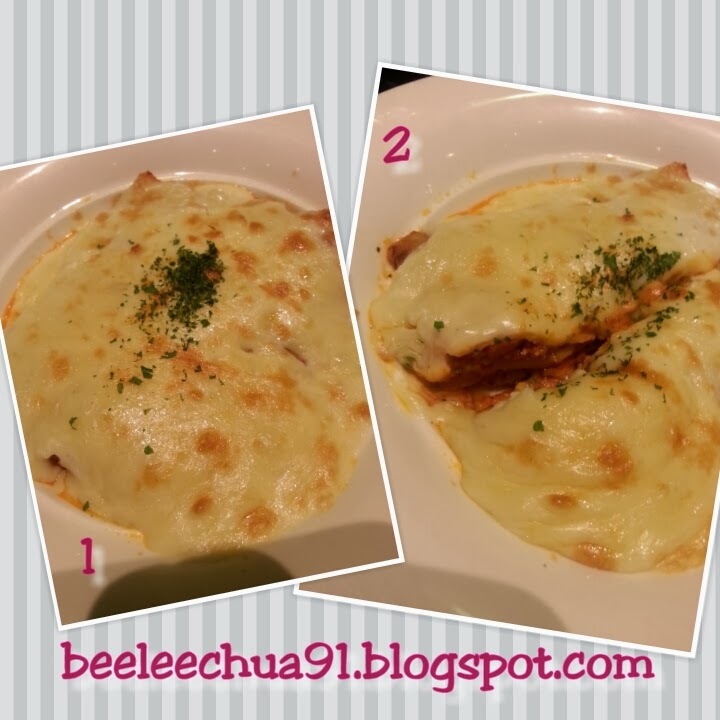 The menu says that it is filled with minced pork cooked with tomato and fresh herbs, bechamel sauce and topped with loads of cheese. In my opinion, the aroma of the pork is not strong enough such that the real good taste is not there yet. But I do feel like the whole thing should taste more cheesier as I feel like I am eating cheese but it is just not enough (I am a cheese fanatic, that's why). Lol. Last came my boyfriend's dish, Piggies Rolling in the Mud. It is under the Asian section of fried rice. The menu says that it contains crumbed pork cutlet topped with mild Japanese currry and mozzarella cheese, served over a bed of fragrant rice. According to him and his taste buds, the dish is not that pleasant. First off, it took such a long time to be prepared and served. 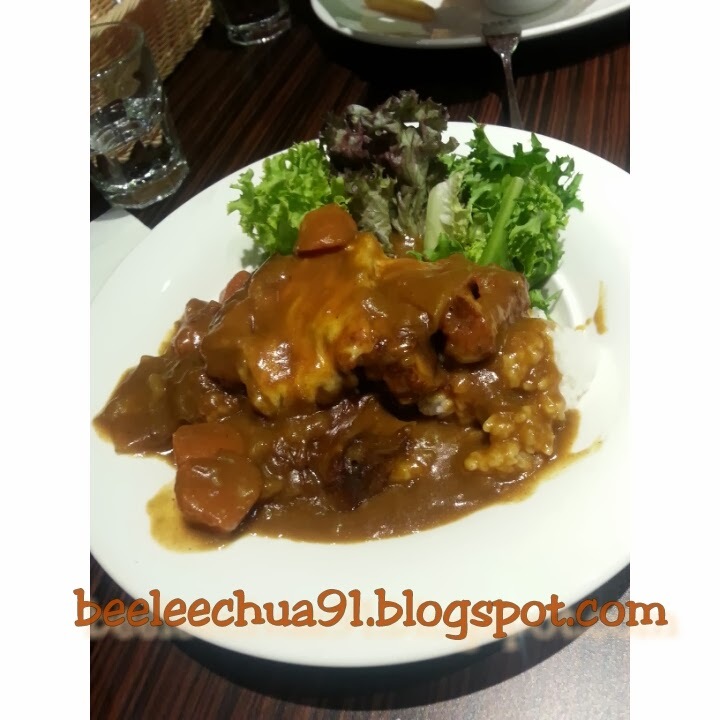 Secondly, it feels like a mix of curry with rice and that he finds the combination of curry and cheese strange. Pardon him for his bad review about this dish as most probably he is a typical Chinese who prefers Asian food more than anything. I like the curry though, however, I did not taste the whole combination altogether so I cannot really comment about it. 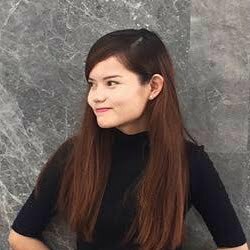 P.s (According to my memory,) the pork burger meal I had from the Big Bad Wolf menu at BSC was so much better from my last visit with my friends some time ago! !